A stunning portrait of young black lives in modern America, for readers of The Hate U Give. Twins Marvin and Tyler couldn't be more different. Where Marvin is reserved, Tyler is charismatic. Where Marvin is consumed by grief for his absent father, Tyler is carefree. And where Marvin is careful, Tyler is daring. But despite their differences, and despite the poverty and trauma that threatens to pull them apart, the brothers are close. Then, one fateful night, Tyler decides to go to a party, and Marvin tags along, hoping to keep an eye on his brother. But what starts out as harmless fun soon descends into a night of chaos that ends in a police raid. And the next day, Tyler is missing. As his mother falls apart and his brother becomes known only as a hashtag, Marvin will learn what justice and freedom really mean in an unfair world. Jay Coles is a graduate of Vincennes University and Ball State University. When he's not writing diverse books, he's advocating for them, teaching middle school students, and composing for various music publishers. 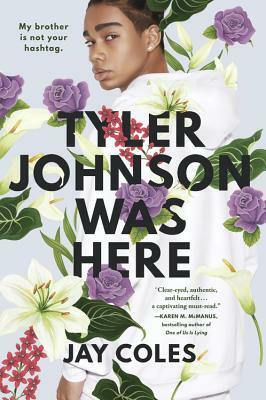 His debut novel Tyler Johnson Was Here is based on true events in his life and inspired by police brutality in America. He resides in Indianapolis, Indiana, and invites you to visit his website at jaycoleswriter.com.